Back in 2008, while trolling for obscure space history trivia in back issues of Aviation Week, I found a good one from 1965: a black and white illustration (figure 1) from The Martin Marietta Corporation of a lifting body rescue vehicle coming to the aid of an Apollo spacecraft that had somehow become stranded in low Earth orbit (ref. 1). The rescue vehicle had an attached service module, and both the lifting body and its service module were labeled NORS, which I recalled from somewhere stood for National Orbital Rescue Service. Martin developed the “SV-5” lifting body shape (ref. 2), which the U.S. Air Force flight-tested as the X-24A in the early 1970s (ref. 3). NASA applied the concept to its X-38 Crew Return Vehicle, evaluated as an attached rescue vehicle for International Space Station astronauts before it was cancelled in 2002 (ref. 4). There are other shapes for lifting bodies, such as the Dreamchaser spacecraft now in development by Sierra Nevada Corporation (ref. 5). Figure 1. Astronaut from a SV-5 lifting body rescue vehicle coming to the aid of an Apollo spacecraft in low earth orbit. Credit: Martin Marietta Corp., 1965. Figure 2. Astronaut from a SV-5 lifting body rescue vehicle coming to the aid of an Apollo spacecraft in low earth orbit. Credit: Columbia Pictures, 1969. Compare that image to the color photo (figure 2) that is a press release from Columbia Pictures for the movie, Marooned, released in December 1969 (ref. 6). It shows the climactic scene from the movie. The similarity is striking, but maybe not a coincidence. Martin Caidin, the author of both the 1964 novel Marooned—in which a stranded Mercury astronaut is rescued by his best friend flying the new Gemini spacecraft—and the 1969 up-dated novel-of-the-movie and also a technical consultant for the movie, certainly read Aviation Week and would have seen that Martin Marietta concept artwork. Caidin may have been struck by the familiar space-rescue theme, and recalled it when he revised his novel for a movie. Maybe this is a peek behind the movie-magic curtain. On closer inspection, the Martin Marietta concept’s service module appears to be a Gemini capsule and adapter section, which in 1965 was the new spacecraft built by another company, McDonnell. It seems to have Gemini-style windows and open right-side crew hatch as well as its general shape. It is impossible to tell from the picture, but perhaps Martin imagined that the nose section of the Gemini containing the parachutes and the re-entry maneuvering thrusters could be eliminated entirely and the remainder of the spacecraft bolted directly to the lifting body, to be disposed of before re-entry. 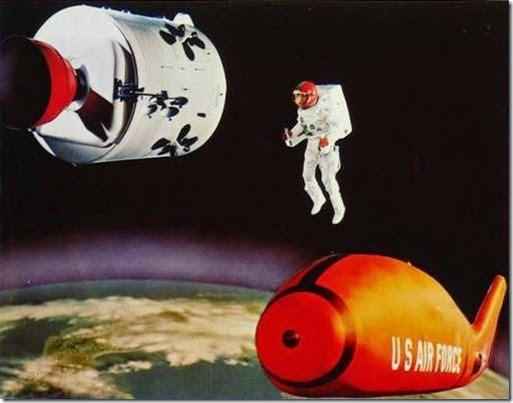 It is unusual to see a company explicitly subsume another company’s product, but Martin provided the Titan boosters for the Gemini capsules and the company’s artist may have felt comfortable enough with it to use Gemini in the supporting role. Martin Caidin (1927-1997) was an American author and authority on aviation and astronautics and an accomplished pilot (ref. 7). He described his involvement with the Mercury and Gemini programs as “a government consultant, newsman and broadcaster” (ref. 8). I didn’t read much of his aviation work in my youth, but I have vintage hardcover editions of his spaceflight novels Marooned (1964), No Man’s World (1967), Four Came Back (1968), Marooned (updated for the movie, 1969) and The Cape (1971) (ref. 9). As an adolescent space geek at a time before the Internet provided abundant space information, I read Caidin’s books as contemporary technical fact with a heavy overlay of human drama. Today I can re-read them to recapture the zeitgeist of outer space as Cold War battleground, its single-combat victor not yet determined. In his later years, Caidin claimed the power of telekinesis although he declined invitations from well-known debunker James Randi to be tested in controlled circumstances (ref. 10). The non-telekinetic aspects of his lifestyle were manifested in his writing style—sort of Dashiell Hammett for the Space Age. Marooned (ref. 11), in particular, appealed to me because of its high technical accuracy and gritty realism in describing the Mercury and Gemini programs: the 1964 novel has eleven appendices listing the technical data, calculations, etc., substantiating the action in the novel. Caidin liked to say that Mercury astronaut Wally Schirra found only one technical error in the book but never divulged what it was, so he could always stay one step ahead of the author. Schirra was a prankster and it would have been typical of him to tell Caidin something like that just to keep him guessing. Oddly enough, one of the things that moved the joint flight closer to reality was a fictional movie called Marooned, based on a novel by Martin Caidin. In the original version, published in 1964, a Mercury-Atlas 10 astronaut is rescued by a Soviet cosmonaut. The movie had been updated (and Caidin wrote a new novel version as well) showing how a Skylab crew might be saved by a Soviet Soyuz pilot. The movie never made much money in the United States, but it apparently impressed the Soviets that Americans were ready to consider international flights—especially to demonstrate the concept of space rescue. The original version Slayton mentioned also had an influence on reality, even more directly than its eventual movie successor, which really only encouraged an international technical project that was already in progress. When the novel was published in mid-1964 (ref. 13), NASA was preparing to send two-man astronaut teams into orbit aboard the new Gemini spacecraft. By mid-December, just a few months before the first manned Gemini flight, NASA managers directed that mission procedures be modified to avoid the Marooned scenario if the retrorockets failed. …NASA Headquarters sent Flight Operations in Houston a set of preliminary data, with orders to revise the flight plan to protect the Gemini 3 crew against the […] the failure of spacecraft retrorockets to work, stranding the crew in space. Headquarters proposed three OAMS [Orbital Attitude and Maneuvering System] maneuvers to place the spacecraft in a "fail safe" orbit, one from which it would reenter whether the retrorockets fired or not. Actually, Gemini orbits were too low to be permanent, so spacecraft reentry was inevitable. What the fail-safe maneuvers were designed to achieve was the spacecraft's return promptly enough to ensure that the crew survived. [That is, before their oxygen ran out.] Coming as it did less than three months before the planned launch, the new demand threw mission planning into turmoil. But the response was rapid. A revised tentative flight plan was ready in little more than a month, and the final plan followed on 4 March. The conservative, Marooned-inspired belt-and-braces approach was used again on Gemini 4, but then discarded after experience demonstrated that retrorockets were as reliable as the engineers had always said they were. In fact, there were never any failures among the six dozen solid-fuel retrorockets used in sets of three on Mercury spacecraft and in sets of four on Gemini. Nor were there any failures among the six Apollo spacecraft that flew Earth-orbit missions and used their large, aft-mounted liquid-fueled engines to deorbit; if there had been, they all could have used their side-mounted maneuvering engines to do so. This was the scenario in the movie, but was glossed over lightly to provide the dramatic impetus for the rescue scenario. In fact, the more likely failure was to orient correctly during the retro maneuver. In 1960, the first test version of the Soviet Union’s Vostok spacecraft accidentally raised its orbit by nearly 250 miles (400 km) because it was oriented nose-forward instead of nose-backward when its single-use liquid-fueled braking engine was fired (ref. 15). Its two components, the landing capsule and the service module, continued orbiting until 1962 and 1965, respectively. In 1962, the second manned Mercury orbital spaceflight landed 250 nautical miles (460 km) beyond its target due to a combination of misalignment, delayed initiation and underthrust (ref. 16). Caidin was directly involved in one more non-telekinetic crossover between fiction and reality. In the movie of Marooned, he appeared in a cameo as a radio reporter describing the arrival of the lifting body at Cape Canaveral for its launch on the rescue mission. The fictional news event he was describing on film was the movie manifestation of the 1965 artwork that may have inspired his update of Marooned, which then positioned that movie to influence the course of the first joint American-Russian space mission a decade later. Photograph caption, Aviation Week, Oct. 18, 1965, p. 69. Reed, R. Dale, with Darlene Lister, Wingless Flight, The Lifting Body Story, NASA SP-4220, NASA, Washington, D.C., 1997. “Martin-Marietta X-24A”, http://en.wikipedia.org/wiki/Martin_Marietta_X-24A (accessed Dec. 13, 2014). “NASA X-38”, http://en.wikipedia.org/wiki/NASA_X-38 (accessed Dec. 13, 2014). Described in “Commercial Crew Development”, http://en.wikipedia.org/wiki/Commercial_Crew_Development (accessed Dec. 13, 2014). “Marooned (1969)”, http://www.imdb.com/title/tt0064639/ (accessed Dec. 12, 2014). “Martin Caidin”, http://en.wikipedia.org/wiki/Martin_Caidin (accessed Sep. 27, 2014). Caidin, Martin, Marooned, E.P. Dutton and Co., New York, 1964, acknowledgments, p. 359. “Martin Caidin summary biography”, Internet Speculative Fiction Database, http://www.isfdb.org/cgi-bin/ea.cgi?342 (accessed Oct. 2, 2014). “Marooned (novel)”, http://en.wikipedia.org/wiki/Marooned_(novel) (accessed Dec. 15, 2014). Slayton, Deke, with Cassutt, Michael, Deke, Forge Books, New York, 1994, p. 277. I don’t know the date when the novel was first published, but it must have been about mid-year because it was reviewed in the October 1964 issue of The Magazine of Fantasy and Science Fiction according to “Martin Caidin summary biography”, Internet Speculative Fiction Database, http://www.isfdb.org/cgi-bin/ea.cgi?342 (accessed Oct. 2, 2014). Hacker, Barton C., and Grimwood, James M., On the Shoulders of Titans: A History of Project Gemini, NASA Special Publication 4203, Washington, D.C., 1977, pp. 228-9. See note 32, memo, Hall to Schneider, "Interim Status Report on Decay Safe Orbits," 11 Dec. 1964. “Korabl-Sputnik 1”, http://en.wikipedia.org/wiki/Korabl-Sputnik_1 (accessed Dec. 10, 2014). Results of the Second United States Manned Orbital Space Flight May 24, 1962, NASA SP-6, NASA, Washington, D.C., 1962, http://ntrs.nasa.gov/archive/nasa/casi.ntrs.nasa.gov/19620004691.pdf (accessed Dec. 22, 2014). Going Nuts in Orion to Mars?